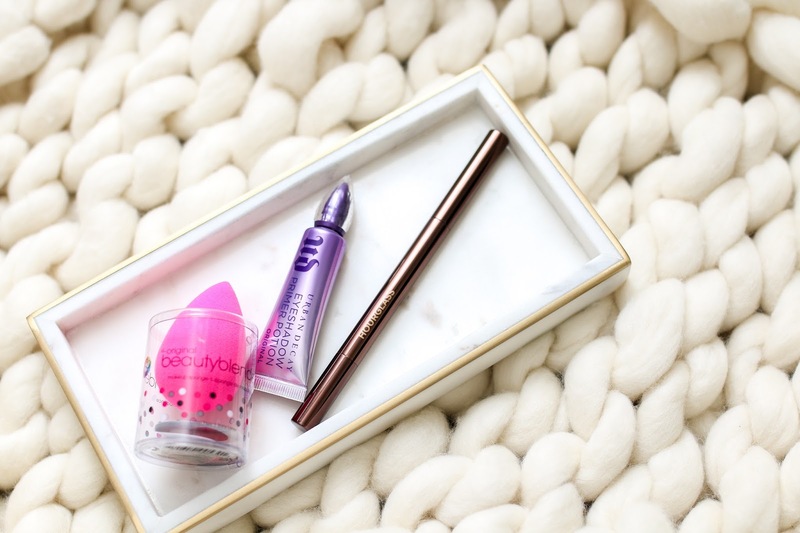 Today's blog post features nothing new, no fancy spring launches but I frankly cannot do my makeup without either of these 3 products. These are the workhorses in my routine that I would never give up, but aren't as fun to talk about as lipsticks, highlighters or eyeshadow palettes. Ha! But they are nonethless essential. 1. Beautyblender - I never really got the hype surrounding Beautyblender but then my skin began to get drier and drier while pregnant and I found myself reaching for it all the time. Now I cannot do my makeup without it. I use it to apply my foundation, blend blush, highlighter, smooth out concealer, touch up midday if I need to - it always gives a flawless application. 2. Urban Decay Primer Potion - I have been using eyeshadow primer for as long as I have been wearing makeup (that is a longggg time). Though I sometimes rotate in the NARS Smudgeproof Base, I always go back to the Urban Decay Primer Potion. I have forgotten it on trips and had to head to a local Sephora to pick up one because it I can't do my eye makeup without it. It helps my eye shadow go on smoother, not crease and last all day. 3. Hourglass Arch Brow Sculpting Pencil - Brows are the most important feature on my face in my opinion. I get them threaded every 2.5 weeks like clockwork (I even went the day that I went into labor #priorities). I have tried numerous other brow tools and occasionally will rotate them into my routine thinking I have found a new favorite, only to go running back to my Hourglass one. The formula is smooth and not too waxy, the color is more gray based which works with my dark hair (I wear Ash and Soft Brunette) the shape of the tool is perfect for filling in but not drawing too dramatic of a brow, and the spoolie is the best one I have ever used. Even if I try other brands, I will keep my Hourglass spoolie nearby because nothing ever rivals how evenly it brushes out the color and how well it keeps my brows groomed. I can't go without mascara!